For more than 300 college basketball teams, the NCAA tournament begins this week. Beyond the highest-ranked teams in the country, the only way to dream of "One Shining Moment" is to win your conference tournament. Three wins — maybe four — in as many days. There's no more rigorous fight for a dance ticket in any sport, including the pros. I think it's more likely we see Josh Pastner pose for a photo with a middle-finger raised than we see the Memphis Tigers win this week's American Athletic Conference tournament. But as Lloyd Christmas emphasized so eloquently in Dumb and Dumber . . . there's a chance. The bracket in Orlando couldn't have been filled more favorably for the 17-14 Tigers. The U of M wants no part of SMU, Connecticut, or Cincinnati, having gone 1-5 against this trio during the regular season. The Mustangs won't even be in the field, serving a postseason ban for academic misdeeds. And the Huskies and Bearcats are on the opposite side of the bracket, meaning the Tigers wouldn't face either team until the final and, importantly, cannot face them both this weekend. Instead, Memphis gets Tulsa (20-10) in a Friday-night quarterfinal. 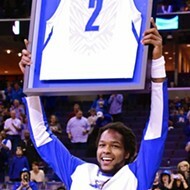 On February 28th at FedExForum, the Tigers beat the Golden Hurricane, 92-82. Most revealing from that contest: Tulsa showed little resistance for the U of M's two most potent threats. Senior Shaq Goodwin had 28 points and 11 rebounds in the victory with freshman Dedric Lawson adding 27 points and 12 boards. In no other AAC game this season did the Tigers shoot better than they did that Sunday afternoon (54 percent). If the Tigers can knock off Tulsa, they'd likely face Houston (22-8) in a Saturday semifinal. Memphis led the Cougars at halftime (48-40) on February 10th in Texas, only to be thoroughly dominated in the second half. Can Devonta Pollard again score 34? Damyean Dotson 21? The Tigers hope to find out while top-seeded Temple wrestles with UConn or Cincy in the other semifinal. 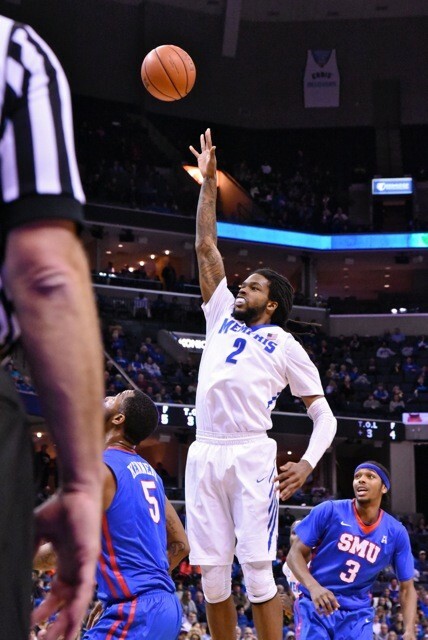 Coach Josh Pastner will likely bring up the story of his second Memphis team this week. The 2010-11 Tigers — featuring freshmen Will Barton, Tarik Black, and Joe Jackson — entered the Conference USA tournament in El Paso with a 22-9 record, having lost three of their last four games and dancing precariously on the bubble of the NCAA tournament field. They proceeded to win the tournament, taking three games in three days, including two over teams (East Carolina and host UTEP) that had beaten them during their late-season slide. The Tigers need to win at least one game this week to earn consideration for the NIT. Eighteen wins weren't enough last year, remember. It's a band-of-brothers road trip for the U of M. Embattled coach, talented but under-achieving roster of players, and virtually no expectations any longer to meet. Lace 'em up, hit the floor, and see what happens. Yep, there's a chance. • Despite finishing seventh in the American, the Tigers feature two players who will be considered for first-team all-conference honors. Freshman Dedric Lawson should make the team, having finished fifth in the league in scoring (15.4 points per game) and atop the AAC in rebounding (9.2). Senior Shaq Goodwin finished seventh in both categories, his numbers this season (15.2 and 8.0) considerably better than those he put up as a sophomore (11.5 and 6.5) when he was named second-team All-AAC. How a team with two such stars managed to finish 8-10 in league play will be a good conversation starter over the offseason.